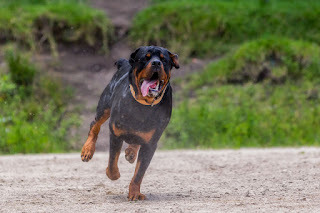 Teaching your dog to come to you when you call him is one of the most important lesson you can teach him, also can be a difficult challenge that many dog owners accidentally mess up. Often called a "recall," coming when called is one of the most important basic dog commands you can teach your dog. Training your dog the recall comand can help you to keep your dog under control while allowing him some off-leash freedom. If your dog doesn’t respond to your comand, try these tricks to get him to come when called. 1.Hold up a treat, then say his name followed by “come” in a clear, excited tone. 2.Never use the recall command with an angry or frustrated tone in your voice. 3.As soon as your dog comes to you, give him the reward, then praise him. 4.Disappear.- If your dog didn’t respond to that Come comand, find a place to hide. A tree, inside the house or anywhere your dog can’t see you will work. 5.Avoid calling your dog to you when you know he’s unlikely to comply. If he’s playing with another dog, running to greet a friend he’s not going to come running when called.